We had a great turn out for our first ever Library Vertical tasting last Saturday. 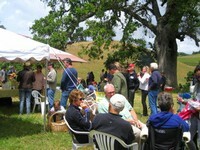 It was a fun and lively group and the wines and the weather could not have been better. We had many requests for the lunch recipe, which is in the link below. 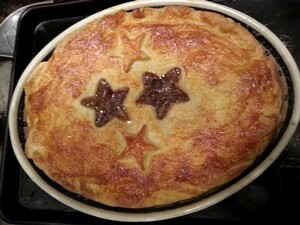 I used this recipe for both the lamb and beef pies. For the beef pies I used stew meat and a top round roast. For the lamb pies, I used shoulder chop meat, stew meat and shanks. Enjoy! We've been impressed with some older Rangeland Wines lately, so we are excited to announce our first ever vertical tasting and special sale of Rangeland library wines on Saturday, February 13. We will start at 11 am with a sit down seminar at the ranch headquarters. Winemaker Paul Hinschberger and owner Laird Foshay will guide you through samples of our estate-grown Cabernet Sauvignon-based wines from 2007 to 2011. We'll also taste a couple of other varieties from our cellar and you'll get a glass of library wine to enjoy with your meal. Our lunch buffet will follow, featuring estate grown, grass-fed beef and lamb Bourguignonne pie (you can have both! ), with veggies, cheeses and some baked goodies. The wines are very rare (just a few cases each), so seating and sales quantities will be limited. Library wines will be priced at $75 each, with a 3 bottle special price of $200. Club discounts will apply. The wines will be available at the event and also on our website afterwards, for those of you who can’t attend. Tickets for the event are $50 (includes tasting, lunch and a glass of one our library wines), before club discount. We look forward to seeing you on the 13th! Purchase tickets now to reserve your place. We are offering free shipping on any 20 pound box of ground beef ordered through March 1, and only $10 shipping for 10 pound boxes of ground beef, while supplies last. For those of you who regularly buy our beef and have it shipped, it’s a great opportunity to stock up. It should help stave off your cravings until the beef club becomes available in June. Although we are sold out of last year's Beef and Lamb Club boxes, we are accepting signups for 2016. Our first Lamb Club shipment this year will be in March, in time for Easter. Our Beef Club will ship in July, as usual. Sign up for clubs here. One of the many reasons I love my job is that I rarely have to do the same thing two days in a row. Whether I’m in the cellar, filing government paperwork, or herding sheep--most days I don't know what excitement awaits me. My official title at Rangeland is Winemaker. For some, this might conjure up an image of me swirling a glass of cabernet all day and mumbling pompous comments about the wine’s nuances of purple petunias and tiger sweat. Others might think that I just sit in my office and write work-orders for my inferiors to complete. In reality, because we are a small winery, I am also the assistant winemaker, cellar worker, and intern/peon. I wash the barrels, clean the drains and I even harvest my own tiger sweat. On top of my cellar duties, I also help out on the ranch with cows, sheep, vineyard projects and basically whatever Laird or Nathan tell me to do. So although my task list may not seem as glamorous as most people’s expectations, I prefer to have some grit in my job description--even if that means shoveling sheep excrement. Read more. We’ll be open, by appointment only, during Vintage Paso (formerly the Zinfandel Festival). We’ll have some Zinfandel on special, and hope to see you during the weekend. Make an appointment any time Friday March 18 – Sunday March 20, from 11 am-5 pm. We’ll be serving our famous grass-fed beef and lamb sliders on Saturday only. We look forward to seeing you then! Save the date and keep an eye out for the official announcement about our favorite spring party. Also, you can see all of our 2016 event calendar here. We loved having club members out to our pickup party last Saturday--the weather was warm and beautiful, the wine was tasty and the company was terrific. We had several requests for recipes, so here they are. We hope you enjoy! For this recipe we used rack meat, cut into individual chops. We marinated the chops overnight. 1. in a non-reactive bowl, combine the olive oil, lemon juice, honey, garlic, onion, mint, parsley, rosemary and oregano. Add the lamb and toss to coat well. Marinate in the refrigerator at least 4 hours. (Can be marinated in gallon ziplocks). 2. Remove the meat from the refrigerator 30-60 minutes before cooking. Preheat the grill or a grill pan on high. 3. Salt and pepper chops, and then grill to the desired doneness, about 3-4 minutes per side for medium to medium rare. Serve immediately. For this recipe we used leg meat, cut into 1-inch chunks. O-bone chops, stew meat or shoulder chops could also be used. The marinade tenderizes these tougher cuts of lamb. 1. Combine the yogurt, olive oil, lemon zest, lemon juice, rosemary, salt and pepper in a large, non-reactive bowl. Add the lamb chunks, and stir to make sure every piece is covered. Cover with plastic wrap and refrigerate overnight. 2. Soak wooden skewers (if using) for 30-60 minutes before cooking. 3. Thread 3-5 pieces of lamb per skewer, alternating with vegetables of your choice. 4. Salt and pepper both sides. Place on hot grill and cookr for 6-8 minutes, turning 2-3 times, until the lamb is medium rare.